I love who-dun-its. A good mystery ends with the perceptive detective uncovering the truth that nobody else saw. Only he or she has found proof that points to the real culprit. 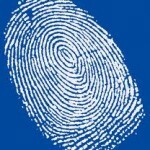 One way is through fingerprints, though thousands of novels and TV episodes point out ways to fake fingerprints or leave none. 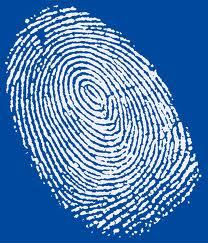 But, fingerprints are one way someone knows you have been there – you have touched something. Fingerprints have even been found inside of gloves! And no two are alike, even on twins. Steven Curtis Chapman sings about when he looks at his teenage daughter he sees God’s fingerprints on her. That means God has touched her, molded her, purposely created her. I want my life to be like a clear glass God has used over and over- covered end to end with His mighty fingerprints – because that will be the testimony that He has never let go of me, never. He has hung tight even in times of my deepest doubts. They will be the proof He has held on tightly in the triumphants and joyous times, and more than that, in the times of anguish and total despair. He has even held on in the in-between times, those times when all is smooth and I don’t think I need Him. A friend of mine always signs her emails with “in His grip”. I like that image. Only God can hold the hourglass of time in his hands and not let the sand “slip through his fingers”. But fingerprints are not always visible are they? They need to be dusted in order to pop out, or can only be revealed with a special light. I think our trials are the dustings.They are made to bring out God’s glory. And, the light that has to be shined in order to see God’s handiwork is the Light of Christ breaking through the mundane with His holy love. I love a good mystery, and there is none greater than the mystery of Christ’s unending love and compassion. More importantly, I know with God holding onto to me, no matter what happens I can in turn hold onto Him as if my life depended upon it, because, well it does. My fingerprints of faith are there on His hands. I hope more and more when my life is examined, there will be undeniable evidence I have held tightly to His fingers.